This church had seating for 500 people when it opened in 1871. It initially catered for summer visitors. At other times worshippers continued to travel out of town to the Old Parish Church or Cefnllys church. Local landowner Edward Middleton Evans donated the new church’s site. At the time it was the highest ground of Cefnllys Common. The building was known as Christ Church until 1881, when it was consecrated and dedicated to the Holy Trinity. Llandrindod denotes the “church of the Trinity”. Most places with the Llan prefix are named after an early church, but the name of Llandrindod parish pre-dates the local church’s dedication by centuries! It was recorded as Llan Yr dryndot in 1543 and Llandrindod in 1549. The church’s second rector was Henry de Winton, archdeacon of Brecon. He had a large rectory built nearby – now the front of the Hotel Commodore. Llandrindod grew rapidly as a spa town after the railway station’s opening. The church was enlarged at various times to take its seating capacity to 1,400 by the outbreak of the First World War. The Church in Wales’ disestablishment (separation from the state and Church of England) was delayed by the war but in 1920 the election of Dr Alfred George Edwards as the first Archbishop of Wales was confirmed here, at Holy Trinity. All of his successors have been elected at the church, which is close to Wales’ geographical centre. 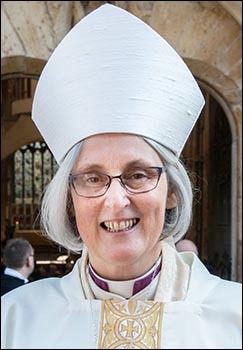 Joanna Penberthy, rector of Glan Ithon (including Llandrindod), was elected the first female bishop in Wales in 2016. She was enthroned in St Davids in 2017 and is pictured right. She was one of the first women in Wales to be ordained as priests, in 1997. A wooden triptych inside the church commemorates local men who died in the First and Second World Wars. You can discover their details on our page about the town’s main war memorial. The church has a stained glass window in memory of the First World War dead. Private Cecil John Edwards, who was killed in July 1917 aged 20, is commemorated by a plaque erected inside the church by his parents. Another plaque commemorates Private Charles Cheffers, who was 30 when killed in July 1918. The plaque was erected by his widow, who lived in Craig Road. The church’s tower was erected in 1995 to host a peal of bells.